Thousands of fans at West Ham’s New Stadium will have Winlet glazing robots to thank for creating the hospitality suits from which they will watch matches in luxury and comfort. The premier league glass lifting machine, supplied by Hird, has been used to install 250 panels of glass in hospitality suits around the former London Olympics Stadium. Winlet proved itself the winning choice for the job, allowing leading glazing and curtain wall installer EAG to maximise productivity and speed of installation in a workspace occupied by other contractors. EAG used the Winlet 600 glazing robot to lift and position 150kg glass panels in hospitality areas. These included roof panels which required glass sheets to be lifted and held in angled over-head positions. This was a task made straight forward by the Winlet glazing robot’s hydraulic boom and built-in four-cup vacuum lifter, which can place glass weighing up to 600kg in a horizontal axis 2.8m vertically overhead. The alternative solution would have been position a crane close to the pitch and lifting the panels up to the hospitality suits which ring the stadium. Kevin Wareham said: “This would have been difficult because of the seating in front of the suits, and slower because the crane would have had to be repositioned. Also, it might have interfered with the work of other contractors on site. “The Winlet glazing robot is small, mobile and can work quickly in a confined space. It was loaded with glass, which was then moved out through the glazing aperture and brought back into the frame for installation. Industry leading safety features, which prevent a load being dropped in the event of a catastrophic vacuum failure, and gyroscopic control of the panel angle when it is moved through both vertical and horizontal axes, eliminating the need for manual resetting and handling, are two other key benefits. Starting next season, football fans will not so much see as look through the Winlet 600 glazing robot’s work at West Ham’s 60,000-seat stadium New Stadium. Winlet glazing robots have proved they’re winners. 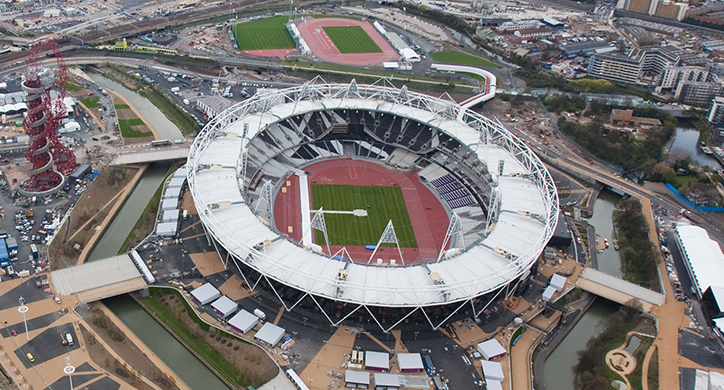 It remains to be seen the New Stadium will have the same effect on West Ham.